An $85,000 Profit Monthly Report: A Guest Post by AffEngineer! Who’s Mateen and What is He Doing on Tyler’s Blog? Before I forget, let me introduce myself, I run a blog called AffEngineer.com. I’ve been monitoring my progress from the day I spent my very first dollar on paid advertising up till today. From seeing 20 days of continuous red, to making a small profit, to turning an 85k profit month in March all within a year of being in this industry, it’s been a crazy roller coaster ride! AffEngineer was inspired by Tyler’s blog in an attempt to document my progress and give back to the affiliate community, especially to those who are still on the steep ‘making money online’ learning curve. I make monthly income reports, just like Tyler, trying to be as informative as I possibly can. I’ve always been told to get a good education and a respectable job. I was told this will result in a happy, financially stable lifestyle. What I wasn’t told was that I’d have to sacrifice all my aspirations, all my innate loves and abilities to make this happen. That I’d have to suppress away all that entrepreneur drive I had in me all through school and university, something I just loved doing. After spending 2 years as a Civil Engineer in Melbourne, Australia, I had realized this. Life was passing me by and conversations with close friends had become so boring and repetitive. We’d have so much to say before but now there was nothing new. Just complaints about work and how we all hate it. Was this all there was to life? Was there no other option? If you were to look around you in the office then yeah, it seemed like there was no other option. But one thing always stood out to me here in Australia. There are so many people that come here from other countries that struggle for a while, but then, eventually end up owning massive franchises making more money then anyone in the corporate field. They didn’t know much english and had little idea of Australias business policies yet they made it happen. This made one thing very clear. There’s a LOT of ways to make money in the world but you have to be prepared to struggle hard for it. With this in mind, in November 2012, almost two years into my career and less then a month before I completed my graduate program, I quit. I had made up my mind that I was going to make this work no matter what. I had a good amount of money saved up in the bank and I didn’t care if it took me every single cent of it to find a self sufficient way of making money. I had no idea what I was going to do, little to no plan, but I was determined to make this work. This is when the real struggle began. For a good six months I was trying everything I could think of. Buying random things from garage sales and selling them on eBay, making phone apps, flipping cars, a bit of blogging here and there. I was making some money, but nothing consistent at all. All these “trying to start a business” experiences taught me something though. They all had the same reasons for being so short lived. Marketing – It was a mystery to me. I had no idea how to get more eyeballs on my blogs, my products on eBay or mainly my phone app(s). This is where I realized how important marketing was and soon after found Tylers blog which introduced me to the wonderful world of affiliate marketing via paid advertising. I knew about seo affiliate marketing before. Greyhat, mainly blackhat spammy stuff but when I saw Tyler pushing 5 figures a month, I was hooked like a fish. What better way to fix my marketing problem then to just jump in and do it while earning loads of money at the same time? I had always been hesitant to spend money, mainly because I still doubted people making any ‘real’ money online. But after stories like this became more and more popular and it became clear that people WERE making good money on the net, I knew I needed to start getting serious with it. Tyler doesn’t know this, but he’s been my inspiration ever since I’ve seriously thought about affiliate marketing. I’m sure a lot of Tylers readers can say the same. I’ve read his every monthly report and a huge amount of his 1000+ posts! I remember sharing around his monthly reports on FB or word of mouth to my friends who were into affiliate marketing. Each one had the same shocked expression as I did when I told them the numbers Tyler was earning. Anyway, 20 days in and all I had seen was red. Not a single conversion. I was trying Google PPC at the time and had little to NO idea what I was doing. I’m surprised I wasn’t banned as I was linking to everything and bidding on trademarked keywords lol. Again, no idea what I was doing. I was learning though and this was enough for me. I knew, as long as I was learning, I was on the right track. That is where the real value was, internal growth, and it would all pay off some time. I also remember this period of 20 days being the most longest, difficult 20 days for me. Being disappointed every morning with no conversions and in total doubt of whether I was capable of this or not. My room smelt like food as I never left it, I looked like Doc from Back to the future and had lost 3-4 kg’s as I was working 10-12 hours a day. I wanted this so badly and was not going to give up. I had 20-30 motivational notes stuck around everywhere to keep me going and for the most part, especially near the end of it, I was forcing myself to continue working. It’s not fun learning everything from scratch. From basic coding/html to design, setting up tracking, learning how to navigate different ad platforms, there is just SO much you have to learn at the start. I kept telling myself that these hurdles are there to separate those that deserve this lifestyle with those that don’t. The warriors from the wimps. The day finally came though. 12/8/2013, it was a Monday, I’ll never forget it. I made 3 conversions at $5.75 each! I was totally over the moon. Still made a loss, but just soooo happy. It was like passing your driving license, no one can take that smile off your face for that day. Pure bliss. It’s funny though because I’d tell my parents and friends and they’d be like…”but you lost $2 so you’re still in red”. I’d tell them “But I made 3 sales!”. They’d just give me a courtesy congratulations lol. 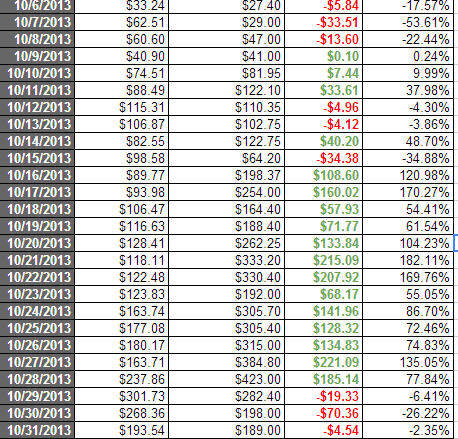 A couple weeks later I had my first profitable day at +$27. I bought all my friends lunch that day haha. Again, they thought I was whack. I kept going though, continuing to expand and grow my campaigns. Testing other traffic sources and just devouring information from absolutely everywhere. I always stressed ACTION with whatever I was doing, making sure I was doing more than I was reading/learning. A lot of people suffer from PTBB, ‘Pretending to be Busy’. They spend the day reading, watching, doing a bit here and there, taking breaks often but if they were to stop and look back at their day and see what actual, valuable, action oriented tasks did they complete, it would be near nothing. Maybe an hours worth if they’re lucky. If you can beat this, you’ll be great at affiliate marketing. I make sure to do a minimum of 4 hours of work without a single distraction. No Facebook, instagram or tv, just pure work. If I stuff up I punish myself by not allowing myself to work the next day. Trust me, it works for workaholics like me! I had joined the popular Aff Playbook forums a couple of days before I made my first conversion. It’s a private affiliate marketing forum where a lot of affiliates just hang out and share ideas. Tonnes of case studies, tips and tutorials, that sort of stuff. I had a ‘follow along campaign’ type thing where I’d post my progress and affiliates would give me advice on how to expand/grow it. 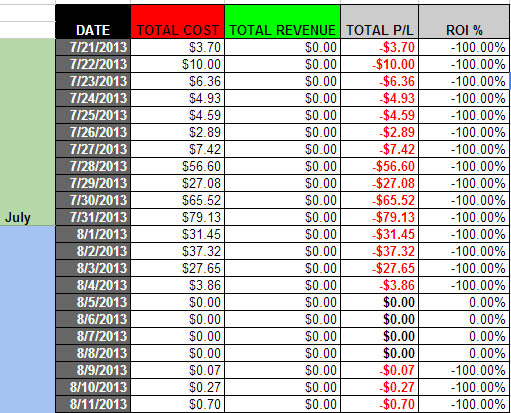 I took all this in and a month or two later was making $150 a day with PPV! You never stop learning lessons though and this eventually dried up and my income dropped, teaching me the importance of diversification. Never put all your eggs in the one basket because that basket WILL fall, and your eggs WILL break, it’s just a matter of when. As time went on I kept exploring, kept reading, kept trying completely new traffic sources, new techniques. At the same time I went on a few holidays. I’d come back every time with a totally fresh mind ready to hit this with full force. I started making waves with Google PPC and PPV but it all reached a completely new level in March this year. The month I made twice my yearly salary in 19 days. Almost every affiliate has heard of teespring. I’ve always made it a point to be focused on one thing till I make it work. At the time I was focusing on Google PPC but every now and then on forums I’d hear peoples’ stories of making massive numbers on teespring. The temptation got too strong and I started making some teespring campaigns. I was relatively new to FB advertising and had to learn everything from scratch. It was like when I first started affiliate marketing. I was pumping out campaign after campaign, learning from my mistakes, tightening my targeting, making better designs, and eventually, 50 campaigns later, I started to see some success. a few campaigns later I had hooked in monster! An idea that was massively expandable. If you’ve been monitoring teespring campaigns you would have noticed a lot of shirts based on names, age, locations, sports etc. Mine was something similar. It had the ability to be have a ‘this shirt is special’ factor to the audience that saw it. I expanded it in every way I could think of. The challenge was just keeping track of everything. I’d spend a full hour or two just figuring out my profit/losses! 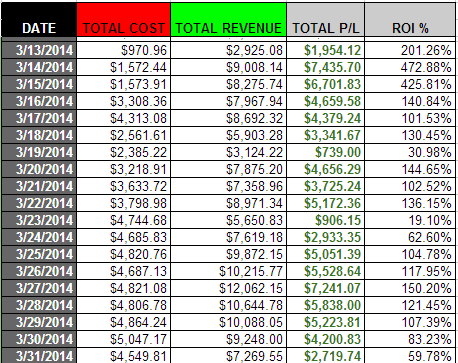 I made around $82,000 in 19 days, see below. The most important takeaway, apart from the money, was that it had completely shattered my mental block of wanting to just make $200 a day. I mean, I nearly hit a six figure month, why was I aiming for something so low? The sky is the limit now and instead of aiming for 3 figure days I want to be hitting 10k+ a day. I know I can do it as I nearly did it before. It’s not just possible, it’s probable, again, just a matter of when. I DO have a good 50+ years to do it :P, (well, hopefully lol). Now days, I’m doing a lot of the same. A large part of my day is split into trying new strategies and recently these ‘new strategies’ have been aimed at growing something organic. In my monthly reports I show a daily breakdown of my profit loss, you’ll notice things have slowed down heaps and I still hit some negative days. Eventually you realize this is the nature of the business. Relying on affiliate marketing income solely through paying for advertising, you’ll always go through ups and downs. Below I’ve listed some habits of mine that have worked wonders for my business. Don’t be Afraid to Jump right in: A lot of people wait to get things 100% right before they get started. This is not the right mentality to have in my opinion. Once you’ve got things somewhat figured, start testing. Test your theories with real $$ and you’ll learn lessons faster then anything else. Keep connected to communities and blogs: People love to share experiences, whether it’s a story like mine, a case study or just a random experience they’ve had. Keep connected to the affiliate marketing communities/blogs so you can be part of all this. It helps you realize how real affiliate marketing is by being surrounded by it so much. AffPlaybook is a good forum to be part of. I’ve heard great things of IMGrind and Stackthatmoney but I’m personally not part of those two so can’t comment. START SAVING: You can’t expect to make money in anything unless you save money. You don’t need a big savings account to get started. You just need the ability to set aside a set $ value consistently solely for affiliate marketing. Monitor your numbers: Affiliate marketing, or business in general is a big numbers game. It’s great to be motivated and get stuck into a whole lot of action but if you’re not pulling yourself back every now and then and seeing if you’re making a profit, you’re going to have trouble. One of the biggest reasons I do these monthly reports is because I can evaluate myself financially and see where all this is heading. After all, We’re in this to make money right? Train yourself to be a numbers guy. This is a good reason why Accountants make great Managers. Don’t be scared and shove aside your ego: Fear of failure and embarrassment is the biggest factor I see contributing to people not giving affiliate marketing a go or entrepreneurship in general. Sometimes you have to put yourself out there in the cold and have faith in yourself and your abilities to change things around. It’s not going to be easy, but it will happen if you go about things right. We’re no one special, just stubborn people: I don’t know about Tyler, but there’s nothing special about me. I’m not talented at this or have any advantages over anyone else. Heck, I had no clue about making websites or marketing before any of this. The only thing I DO have is the ability to just keep going. Keep pushing, keep grinding and faith that it will work out. I’ve had many instances where I’ve had a week or two in solid red, only to have a massive week in green that more than covers my losses. 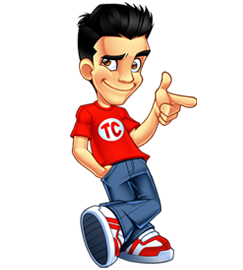 One of the biggest things I’m working on at the moment are a huge set of free tutorials on Teespring/Fabrily. It will cover everything from design to targeting to monitoring and expanding your campaigns. I’m hoping to have all videos and articles out by the end of this month, (August). Keep checking up on this page as I release them slowly. Note: – Once you’ve watched the videos, it doesn’t mean that every campaign you launch from now on you’ll be successful with. Affiliate marketing is a game of quantity with an adequate touch of quality. It’s about throwing out a bunch of things every day and seeing which work, then honing in from there. Expect to see profitable campaigns now and then but still a good amount of failures. For me, 1 in 8-10 campaigns will turn a profit and I’m pretty much using the techniques covered in these videos. It’s always important to keep in touch with bloggers like myself and Tyler and communities that share real time information. The space is always changing and you want knowledge that works for you today, not something that made someone a pot of gold 3 years ago. The road is long and difficult, but is well worth it. It won’t come easy, it make take months or even years to see the light but if you’re serious about this and give your self no other option but success, you WILL get there. I still remember being asked if “I’m sure I want to do this” by my area manager at work. I knew he was thinking of me of being naive, and I probably was. All I knew is if I put myself in a situation where the only way out is to be successful then my survival instincts will kick in. The more desperate you are for it, the quicker you’ll make it. Great post. Can you tell us some of the networks that currently work with? Currently just Teespring and Fabrily. When I used to do some PPV and PPC before, they were MaxBounty, AboveAllOffers, Shareasale and a couple of private ones. Hope that helps! Did they pay you to say this? Lol I saw those guys pitching everyone at ase. Awesome post and I can relate to the ups and downs. It looks like you’ve broken through to become profitable so congratulations. Great post Mateen, thanks for sharing! Tyler was my inspiration 1 year ago as well and I left him a comment then. I’m still on the climb and doing about 5k a month now. This is inspiring. At least, a newbie would be able to follow the advice laid out through the experience. Its good to know that patience and consistency are still important virtues when it comes to making money online! This post was found in kingged.com where it was shared and upvoted for Internet marketers and bloggers. A lot of the things you covered in this article relate to my own experience, especially the part where you said you had a profitable day of +$27. At the rate I’ve been going, I’ll take a day like this anytime. I have a blog that tells funny stories. I know how to entertain people, but don’t know quite how to monetize the site. Monetizing a website is the easiest thing. Getting the traffic is the hard part. Hi, I,ve been following Matten and this is my first visit to this site, as suggested by him, Best thing is: You guys are real deal, so theres plenty of advice that is based on real hands on experience and not just some blog-marketing to milk the newbies. So, Now the only thing left to do is just follow your path, face our own failures, learn from them so we can experience our own wins.rinse and repeat until massive success is (eventually) achieved. I’M a 16 year old blogger & i am a cool guy like you. I play online games DOTA 2, COD, TF2 etc… will be happy if you give you’re steam username will add you on steam and letz game together forever !!! $85K ? Really is it possible? I can not even earn only 500$ ? how you guys doing this things ? What are the methods ? I read your all contents today but how can I start ? This is an amazing site that provides high quality products to cure gray hairs.